Globe Pequot Press, 9780762750085, 204pp. 100+ simple-yet-sophisticated desserts for the undomestic diva There comes a certain point in a women's life when she realizes that store-bought cakes and cookies for special occasions just aren't going to cut it anymore. But she has neither the time nor the experience to create the desserts she sees on the Food Network, and has an aversion to the "semi-homemade" craze. You Made That Dessert? is for this woman. This book shows the savvy, modern woman how to make fabulous, beautiful desserts for any occasion without running all over town for exotic ingredients; without a kitchen full of expensive tools; and, most importantly, without feeling overwhelmed. 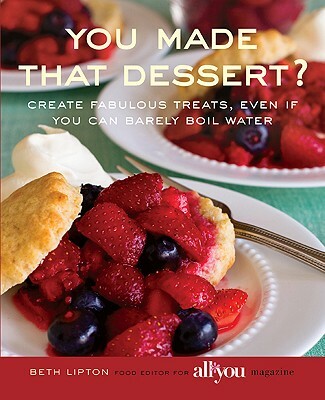 With more than 100 recipes, accompanied by 50 full-color photos and Beth Lipton's lively prose, You Made That Dessert? also explains basic baking principles and techniques. The recipes are easy, and mostly quick, but without sacrificing quality. Family and friends will ask, "You made that?" as they savor desserts including Molten Dark Chocolate Cakes, Fudgy Toblerone Brownies, Spicy Pumpkin Custard, and Cherry Clafouti. Since September 2006, Beth Lipton (www.bethlipton.com) has been the food editor at All You magazine, which reaches 3.5 million readers per month and is distributed through Wal-Mart stores and via subscription. Her photo and byline run in every issue, in addition to her "editor's choice" column where she features new tools and ingredients. She was also the founding food editor at Quick and Simple magazine; is a trained pastry chef; and maintains a baking blog, cookiepiebklyn.blogspot.com. Are you traumatized by special occasions that require a sweet ending? Do you always offer to bring a salad to potlucks? If so, Beth Lipton's "You Made That Dessert?" could be your salvation. She has excellent taste (and by that, of course, I mean she shares my taste). Nothing is too fussy, but much to her credit she doesn't succumb to pre-fab shortcuts. This is a book for anyone truly interested in gaining some baking skills and understanding what's going on without getting a degree in chemistry. She covers a little bit of everything with chapters on cookies and bars, cakes, custards and puddings, pies and fruit desserts, candies, and sauces and frostings. She even includes a final chapter entitled "Emergency Desserts (Don't Panic!)." This is basically cheese and chocolate; a good reminder of what you can do in a pinch. As I flipped through, I found I was marking more recipes to try than I passed over. I settled on three: Geraldine's Chocolate-Date Cake. Its wonderful blend of flavors -- coffee, dates and chocolate -- enticed me. The dates act both as a sweetener and a moistener for the cake. Warm Gingerbread Pudding Cake seemed right for the season, as we had that cool rain rolling in last week. It's one of those "impossible" cakes with liquid poured over the batter before it goes into the oven. This magically turns into a gooey bottom layer. Let me tell you how good this smells when it bakes and how perfect it is with a dollop of whipped cream. Bliss. Great Big Coconut Cake. This bundt was not as successful. It looked promising with the layers of flavor provided by coconut milk and flaked coconut. But the amount of leavener killed it for me. The cake rose to a perfect height, but tasted more like a biscuit. Not a bad thing, in truth...just not what I wanted. I plan to try several other recipes in the book, including Chocolate-Peanut Butter Pie, Molten Dark Chocolate Cakes, Silky Chocolate Nutella Mousse and Mocha Cream Pie. Nowadays, I don't add many new cookbooks to my shelves because there are just so darn many competing for attention -- themed, specialty, holiday, allergy, you name it. Even with precious little space, this is one I'll make room for. Generally speaking: Plenty of doable recipes to wow family and friends. You'll find familiar recipes, such as pineapple upside-down cake, but new ones to try, too, such as tiramisu cake. You'll be inspired to whip up something sweet. For: The average home cook with some experience. Some recipes have long instructions that may be intimidating but there are no difficult techniques. "You Made That Dessert? has the honest simplicity of Joy of Cooking, but with baking pointers from your mom. Every step of the way you are getting tender reassurances that you are on the right track. This is a great book for beginners and anyone who already bakes. I have my oven preheated and I am ready to bake!" -- Karen Tack, co-author of Hello, Cupcake!